eFreight Suite application will be temporarily unavailable from Sunday 2nd July 2017 12:01 AM (IST) to Sunday 2nd July 01:00 AM (IST) due to scheduled maintenance. Sorry for the inconvenience caused. Thank you for your kind understanding. NewAge provides a complete feature rich end to end eCommerce suite for Freight Forwarders, SOCs, Custom Brokers, Carrier Agents, Third Party Logistics, Multi Model Operators, Movers and WMS. eFreight Suite is the powerful freight forwarding system which has been matured for 15+ years and implemented in 30+ countries and it has now become the Industry Standard. Our freight forwarding software is conveniently available in Cloud Computing model and can be accessed by the freight forwarders through web. eFreight Suite gives absolute flexibility and visibility of procedures and documentation whilst retaining total and instant financial control at all stages of freight movement. Our Cloud Computing model avoids initial investment on Servers and makes our software a value for Freight Forwarder's money. 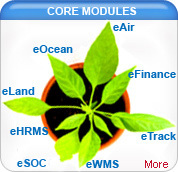 eFreight Suite is the best software which helps our customers to grow their business. eFreight Suite is simple and easy to use due to its user friendly and comprehensive interface. eFreight Suite is flexible enough to support you as your business grows. Company data is shared across business functions, which reduces admin processing time and business costs, and minimizes the risk of errors. Also provide comprehensive financial and operational reporting to the business. For more information on eFreight Suite, download a full color PDF version of our latest brochure. We provide online help option to all the eFreight Suite users via Package and will be the first level of support (via FAQ Screen and video’s) to end user. If you would like to make a comment / questions related to online help features, you can simply e-mail us at customercare@efreightsuite.com . Is your Browser Compatible for eFreight Suite? Our Freight Forwarding Software Network. © 2013 eFreight Suite. All rights reserved. Powered by NewAge Software & Solutions. Site best viewed in 1024 x 768 screen resolution.